Did you know that the word “flamingo” comes from the Latin for “flame,” and a “flock” of flamingos is also referred to as a “flamboyance”? How very logical, and how very appropriate! When we saw Iván Gabaldón’s flamingo photographs, we immediately knew we wanted one of them on our magazine cover. Any one of the 10 photos he shared with us would have made a spectacular cover, but we all agreed that the one of the adult tending the egg in the nest is something very few people will ever have the privilege to see. The female lays only one egg, which is tended constantly and equally by both parents. 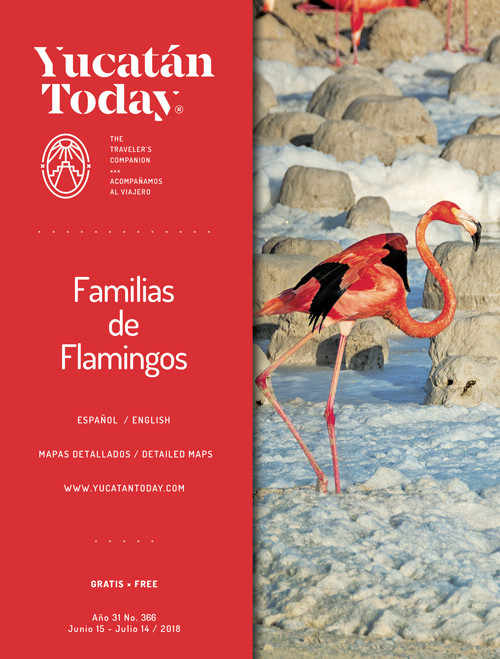 The Gulf coast of the Yucatán Peninsula is one of the Caribbean Flamingo’s few habitats, and a big draw for tourism in Celestún and Río Lagartos, so it has always been on our minds to feature this magnificent bird on our cover. But therein lies our dilemma! As much as we are in awe of their beauty, and proud to have them in our midst, the very tourism that drives our economy is the one thing that can do them significant harm. When observing flamingos in your tour boat, the guides are strictly trained not to get too close, as their feeding cycle will be interrupted if they fly away in fear. You will not be able to witness the nesting grounds shown in our cover photo; Iván had a special permit only granted to scientists and specific wildlife observation project participants. As Iván says, we are very privileged to be in the presence of these birds all year round in Yucatán, a region which is also the habitat of turtles and jaguars, two other species which are under strict protection. I’m happy we could share this glimpse of the flamingo families with you; and let’s continue to respect all wildlife, wherever we go.